Japanese Goods - the traditional items and culture in Japan. Japanese Goods introduces Japaenese traditional items and Japanese culture to abroad. Mainly traditions, and plus a little trend culture, sometimes deep affections of people in Japan. From one hundred and fifty years ago, people in Japan started to pursue more and more wealth. But we have already known that all the wealth stands upon communal resources, and it has the end. Little by little, people in Japan have to change the lifestyle and the concept of values. Only a hundred years ago, we had no high-tech items, but had overflowing joys as well as today. To know traditions is to recognize the past values and the past wisdoms again. I believe that it will help you and us to brush up own lives more brilliant. cloths, and just held with a sash/belt named "Obi". and seasonal symbols. It will become an established decoration of your room. How to select, when you purchase the one. How to tie "Taiko Musubi"
Some Japanese ceramics are decorative, some are polished, and some are earthy. 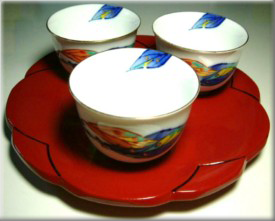 There are various types of ceramics in Japan with numerous potteries. All the production areas have their traditions, and continue to make large efforts to improve their ceramics. Some of them are influenced from Sado, some are pursuiting own art, some are trying to revive the past works. One thing we can surely to say is that Japanese people love to make or use ceramics, often specially. 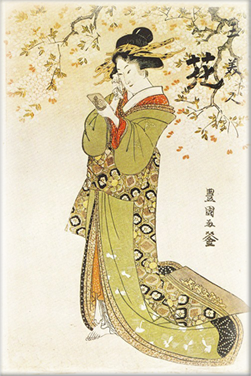 Top Page Attraction and Features of Japanese pottery and porcelain. Glass wares in Japan, etc. Japanese people love own traditinal culture and traditional crafts, so in Japan numberless traditional craftworks continue to exist, such as lacquer wares, glass wares, bamboo wares, wood works, metal works, dolls, etc. We would like to pick up each item and explain its attractons. 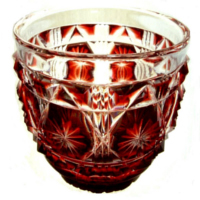 Now, we have two glass wares' pages for Satsuma Kiriko and Ryukyu Glass.